Peach Fizz Jello Shots are about to become your go-to summer cocktail! Super easy to make and crazy good, these shots disappear in a flash! Place your plastic cups in a single layer on a baking sheet for easy transporting. Pour the gelatin powder into a medium mixing bowl. Add the cold water and stir to combine. Let sit for 3 to 5 minutes, or until the gelatin has absorbed into the water. In a small saucepan, bring 1/2 cup water to a simmer. Pour the hot water into the bowl with the gelatin and whisk to combine until the gelatin is melted. Pour in the sugar and whisk until the sugar has melted. Pour in the Alizé Peach Vodka and soda (or champagne) and stir to combine. Pour the jello mixture into the plastic cups, filling them almost to the top. Place the jello shots in the refrigerator for 1 to 2 hours, or until the jello is completely set. Cover each cup with a lid and chill until ready to serve. I like to top my jello shots with a thin slice of fresh peach for presentation points. 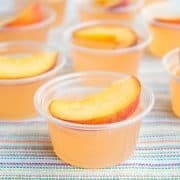 If you like having the fresh peach in your shots, you can finely dice the peach and add a 1/2 teaspoon of the peaches to each cup before pouring the jello mixture in.